BRRRRR! Winter is on it's way. Now, it's not quite like my picture below (just yet) but it will soon be time to think about where to keep your boat this winter. 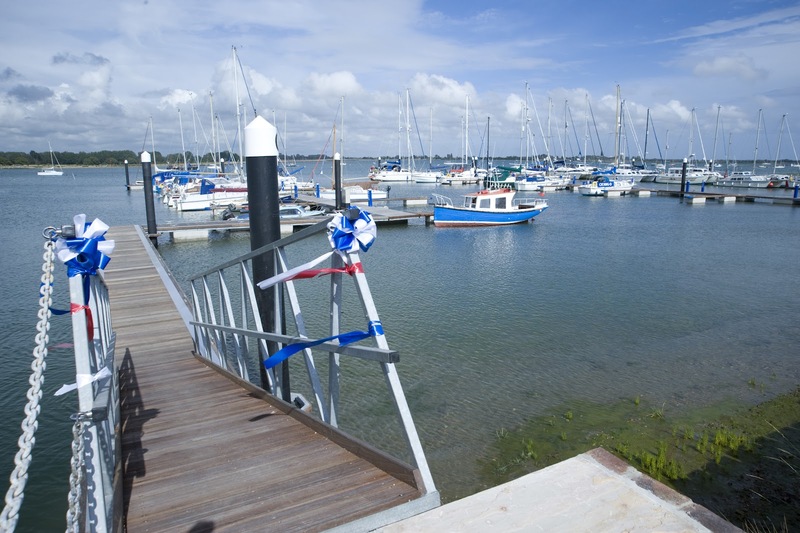 Most of the boat owners in Chichester Harbour have already paid their £100 deposit to winter at Thornham so why not join them? Because I don't want you to feel too sad that summer is over, for the next 2 weeks I will give any boat owner that pays a £100 deposit a 5% discount off their winter package! I will also give you a further 5% discount if you pay for your winter package upfront - by doing this you could save yourself lot of money and secure your space in the best winter storage boatyard on the South Coast! 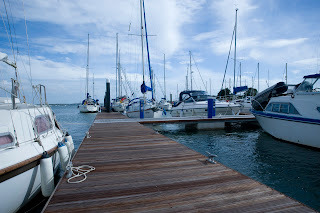 Although it has been an extremely busy summer with the replacement of the pontoons completed Cliff and John have been preparing the yard for your arrival. 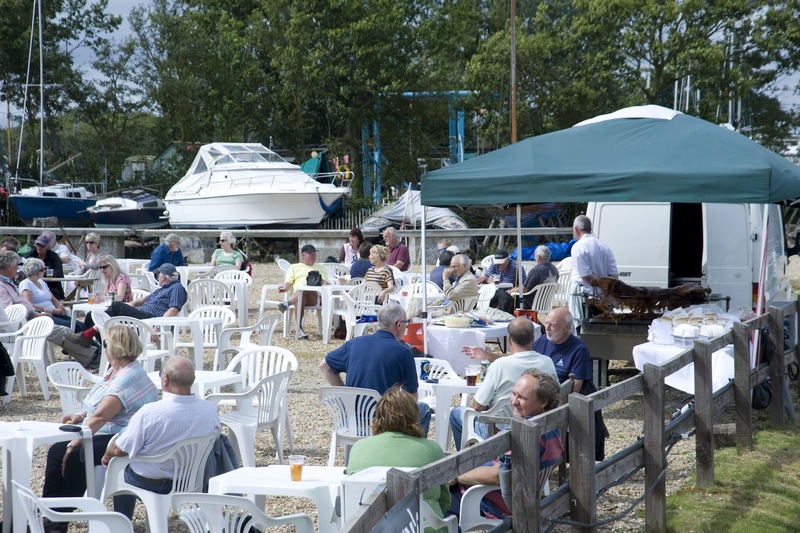 If you want to be part of our extended family and save yourself lots of money then call Courtney or Jeanette on 01243 375 335 or email, info@thornhammarina.com. We look forward to seeing you all this winter! P.S, If we do get the Indian Summer that we have all been hoping for and you've already booked your lift out date give us a call. 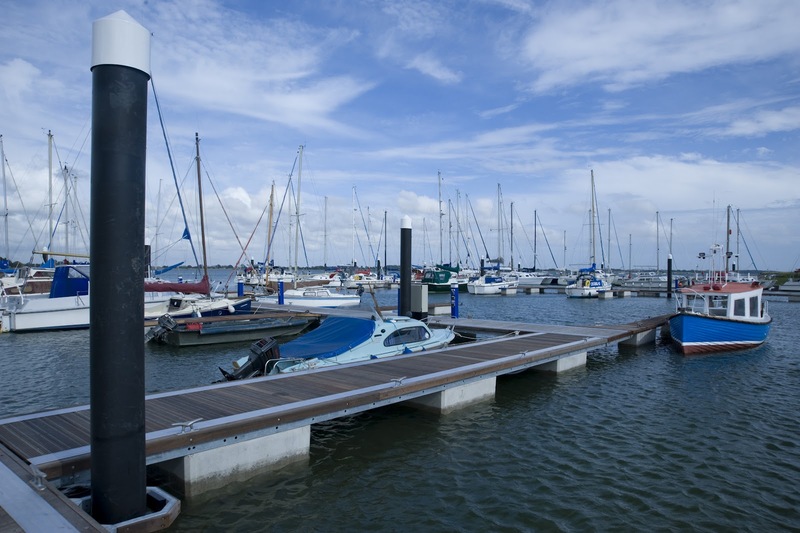 We offer the flexibility most marinas don't and we only charge for the time you come out to the time you go back in! Call now on 01243 375 335 to secure your space, save lots of money and experience a winter storage that is second to none. As mentioned in my previous blog, John was taking part in the Triathlon organised by Tri It Sports held at the marina. It was a fantastic day and the event ran very smoothly. The rain held off until the last of the runners crossed the finished line! John completed the Triathlon in an amazing 2hrs and 54 mins! Congratulations John! Jeanette had a chat with John after he crossed the finish line! After John's successful Triathlon we are thinking of entering a Thornham Team next year! & He Made It Back! Notice to Berth Holders & Boat Owners..
On the 27th of August a Triathlon will be taking place at the marina organised by Tri It Sports. The swim leg of the event will take place in the northern part of Thorney Channel; in Nutbourne Bay and Prinsted Bay, commencing 0730. 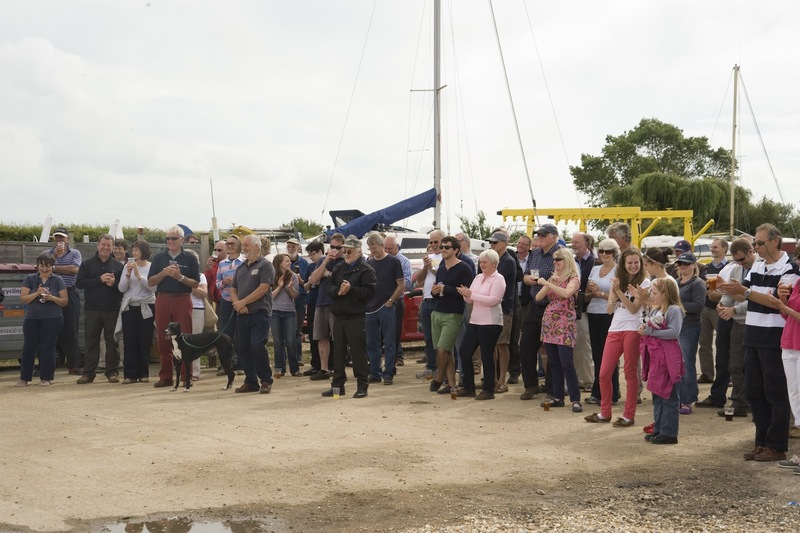 The course will be marked by a series of temporary buoys laid outside of the main navigable channels, until the final approach to Thornham Marina where the competitors will exit the water. It is anticipated that the final competitors will have exited the water by 0845. Boats travelling to or from Thornham Marina, Paynes Boatyard or Prinsted during this period are requested to keep a good look out for swimmers and proceed with caution. Please be aware that whilst driving to the marina, the lane will also form the first leg of their run around the surrounding areas. If you have any questions about the event, please call the office on 01243 375 335. A Visit From West Wittering Juniors! On Tuesday, 21st August our pontoon's were decorated with an array of colourful topper's and excited hungry children! 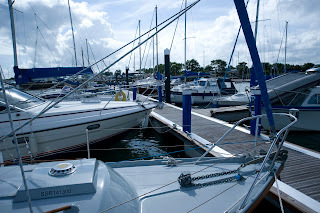 Each year West Wittering Sailing Club hold a junior week with lots activities around Snow Hill Creek in the harbour. During this week they also plan a 'destination sail', which allows the confident young sailors to sail slightly further afield enabling them to use the skills they have learnt during the week to plan their course. Although it was not the sunniest of days, it was very warm with plenty of breeze. We love welcoming the Juniors to Thornham for the afternoon. 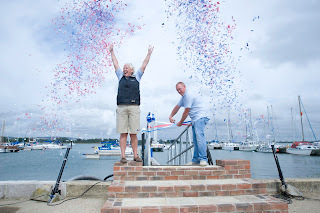 It really is a lovely sight to see such enthusiasm for sailing in the younger generation! What a fantastic way to spend a week of your summer holiday. Triathlon at Thornham Marina - 27th August 2012! On the Monday 27th of August a Triathlon will be taking place at the marina, organized by Tri It Sports! It will involve a dog legged 1500m swim in Prinsted Bay, then will they jump on their bikes for a 45k cycle through the South Downs, once back they will then enjoy a scenic 10km run along Chichester's Shoreline. What a beautiful way to start Bank Holiday Monday! John a member of the Thornham Team who is very active will be taking part! If you fancy taking part, talk to the team at Tri It and pick up your entry form! I will post the results after the event - Let's hope we get a gold! Despite a wet start to the day, the sun shone upon a glorious afternoon on Saturday the 4th of August for our annual BBQ! Over 180 joined us for the afternoon, enjoying a deliciously cooked hog roast (thanks to the BBQ & Banqueting Chef), 75 litres of Pimm's, wine and jazzy music. 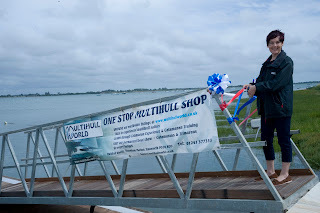 We also had our grand ceremony for the opening of our new pontoon berths. (pictures below) Jeanette gave a small speech, thanking the Walcon Guys, Ron our Electrician, George and his Builders who made the path look pretty again, The Thornham Team, Jonny our MD, and last but certainly not least, you the Boat Owners! 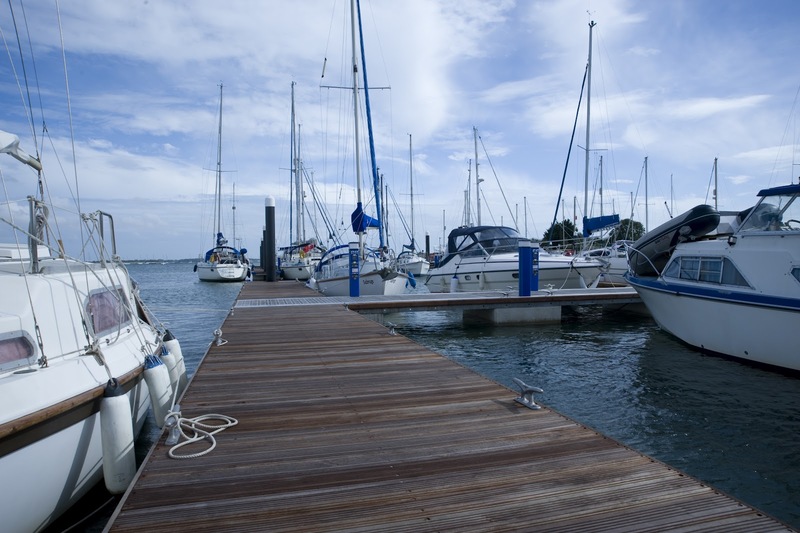 With out your loyalty, we would not be able to complete these amazing projects to enhance the marina. Thank you to all those who made it, (and rushed back from Olympic events!). The Thornham Elves Are Out Again! The Thornham Elves have had a busy week sprucing up the yard and making preparations for the infamous Annual BBQ! 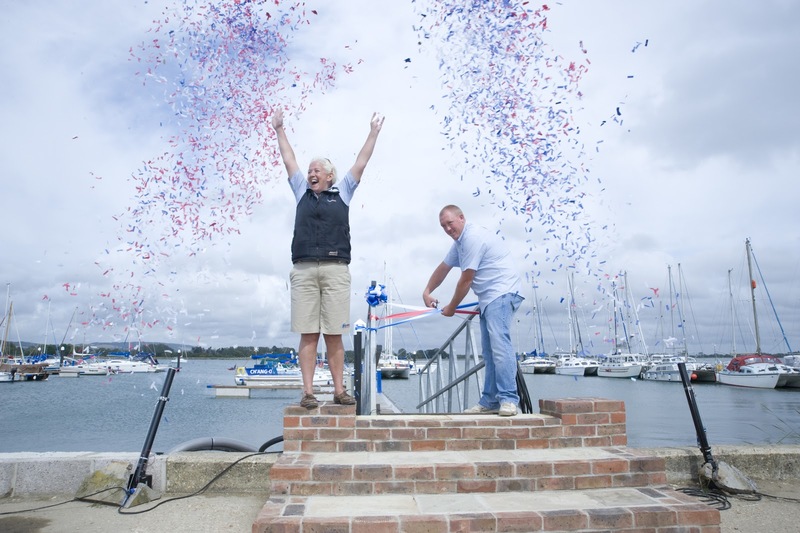 But that is not all this year, we also have the grand opening ceremony for our new pontoons! (WHOOOPEEEE!!) 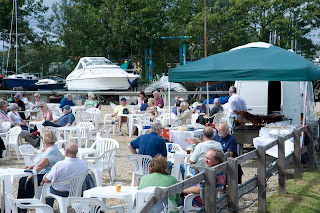 With over 180 Boat Owners attending, this year will the biggest yet! Rain will not stop play for this event - hey, we're all sailors so we all own waterproofs! The event will start at 2pm, Opening Ceremony 2.30pm, Live Music , Food & Pimm's from 3pm onwards. We also have garden games and a bouncy castle for the children. We hope you can join us this fantastic day! Over the years, Thornham Marina has set up affiliations with sailing club's through out Chichester Harbour. We decided we'd like to give something back to the local sailing community and say thank you for you using the facilities at Thornham Marina during the winter time. 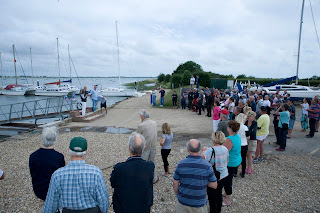 This year I am pleased to announce that over £2000 has been donated to Bosham Sailing Club, Thorney Island Sailing Club, and the Southerly Owners Association. The money donated can the be put towards maintenance of the sailing club, moorings or funding activities/trips for members to take part in. This year we will donate up to £150 to the sailing club of your choice when you winter with Thornham for the first time! 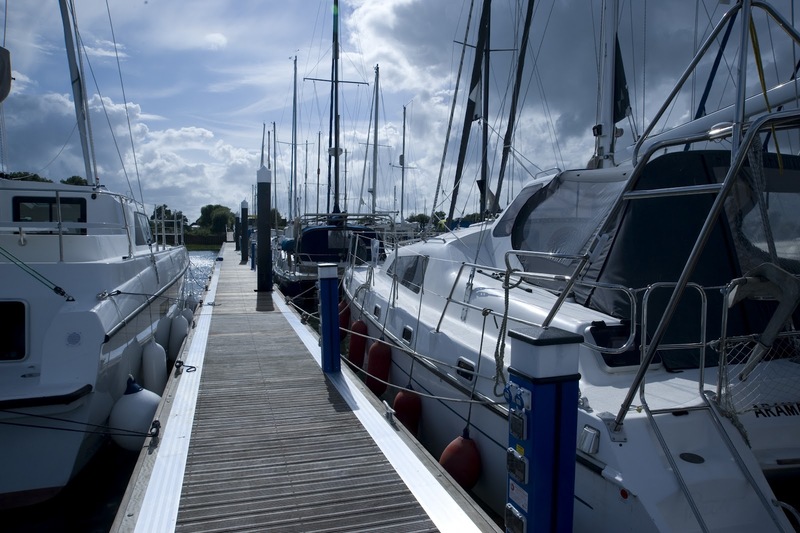 Call Courtney or Jeanette on 01243 375 335 or email info@thornhammarina.com to get your quote for winter storage and find out about our early booking discounts. Help us to help your local sailing community!